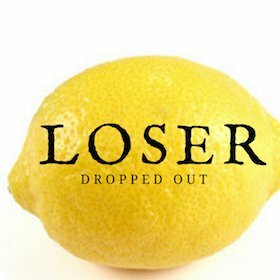 2018 MARKET UPDATE: LEGION SEEING STRONG GAINS -- RARE BOOK! This book is REALLY tough in all grades. Whenever a book above VG comes to market, it tends to set a new price record for that grade. I'm happy to say I got myself a copy of this book this year! Long-time ambition. It has TONS of upside. This is under-valued. A new record has been set for CGC 8.5 of this book since we last updated the Hot 100. 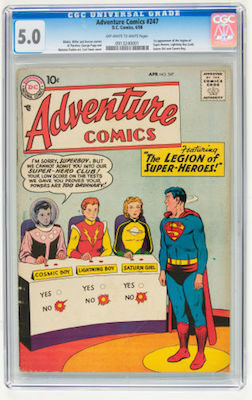 There are not many hot issues in the run of Adventure Comics, but this is one of them! Observers of the DC Universe are waiting with bated breath to see what the next big movie announcement will be, and LSH is one of those mooted as a possible star. Keep an eye on this book and buy the highest grade you can afford. Suddenly, a bunch of long under-valued Silver Age DC key issues are getting hot. Mainly due to all the movie releases and speculation about crossovers and potential sequels. 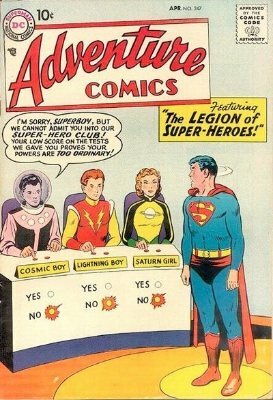 Adventure #247 joins the likes of Action Comics #252, a bunch of the more important Showcase books, and Brave and the Bold #28 on the Hot 100 list. For years, Marvel keys have been stronger priced than their DC equivalents, so we see much more upside in these than their Marvel counterparts.